Wendy Butler’s New Book “The Tale of Tito's Tail” is a Riveting and Inspiring Piece of Fiction that Teaches the Importance of Responsibility. 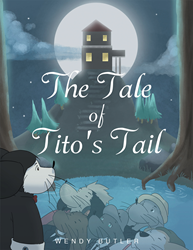 Recent release “The Tale of Tito's Tail” from Page Publishing author Wendy Butler is a prolific work of fiction that delves into life lessons and the importance of growing up. Wendy Butler, a creative author, has completed her new book “The Tale of Tito's Tail”: an imaginative and extraordinary life lesson for children of all ages! Coming from a small town often lends itself to being the last one in a group of city folks to learn the most important of life’s lessons. No one knows this better than Wendy Butler. Born and raised in the small town of Genoa, Arkansas, Wendy found herself facing reality once she faced the real world in the big city of Texarkana. She feels the most important items that need resurfacing in childhood development pertain to ethics, manners, respect, and appreciation. “The Tale of Tito’s Tail” is her way of demonstrating how life’s curve balls are only discouraging if a person lets them be. Something can be learned from every adventure and conflict that Tito encountered. She first met Tito at the bottom of a trash can in the middle of the night, and he quickly became the center of a tall tales speech. The story of Tito grew to a village, and no story can unfold with adventure without a sidekick. Ricky was inspired by a stuffed animal that belonged to her as a child that kept her from being afraid of the dark. Published by New York City-based Page Publishing, Wendy Butler’s tale touches the hearts of readers from across the globe. From a young pinky, Tito has been allowed to play and have no responsibility. As he matures, he gains chores and begins to develop a role throughout the village. All the while, the Boom Rockers have regular adventures that he must attend because that is where his allegiance resides. He hides the balancing act of a pack leader amongst his friends and acquiring new tasks from a more mature end within the village. His inner conflict of how to become the young buck every villager expects of him becomes increasingly taxing because he’s not sure how accepting his clan will be to his new demeanor. After all, his friends have followed in his shadow without him ever realizing, but one at a time, they begin to have their own spotlight. Can Mr. Adagio help to make sense of it all? When the leader of the village, Uncle Guido, decides to throw a project at Tito, it’s a great deal of stress that Tito manages to pull off, but not without the help of his friends. The clan once known as the Boom Rockers slowly molds into a sharp-dressed mafia of problem solvers for the village. Tito learns the definition of true friends when the size of the village more than doubled in size overnight. While exploring into the great unknown of Genoa, Italy, little does he know he will also expose the reasoning behind the shortage of cheese throughout his village. He never meets a stranger, but now, he’s forced to. Readers who wish to experience this inspiring work can purchase “The Tale of Tito's Tail” at bookstores everywhere, or online at the Apple iTunes store, Amazon, Google Play or Barnes and Noble.